I have frequently shied away from the topic of Israel for a variety of reasons. It is time to speak out because Christian Zionism has become a formidable and dangerous movement. By portraying the modern state of Israel as God’s chosen people on earth, the role of the church has been reduced in the eyes of many to providing moral and biblical justification for Israel’s colonization of Palestine. Those who oppose her are demonized. While not all Christian Zionists endorse the apocalyptic views of Hal Lindsey and Tim LaHaye, the movement as a whole is nevertheless leading the West, and the church with it, into a confrontation with Islam. Using biblical terminology to justify a pre-emptive global war against the ‘axis of evil’ merely reinforces stereotypes, fuels extremism, incites fundamentalism and increases the likelihood of nuclear war. 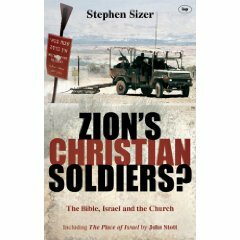 Sizer then spends the next six chapters delving into the details of what the Bible says about literalism, Israel, the Promised Land, Jerusalem, the temple, and Armageddon. At times, I found his arguments a bit difficult to follow (more likely due to issues in my brain, not his), and the charts slightly difficult to understand given my lack of theological training and the complexity of the topic. In spite of my own inability to understand, for those interested in examining an alternative perspective to Christian Zionism, his work is well researched, supported and organized. · Is the way we view Israel and the church assisting or hindering God’s plan? · Are we ‘doing justice and loving mercy’ in the Middle East, or are we exacerbating tensions? · Are we walking in the way of peace or are we hindering reconciliation between Arabs and Israelis? an exclusive theology driving a political agenda which elevates one nation over others, rather than an inclusive theology centered on Jesus Christ, the Savior of the world. In its worst forms, Christian Zionism uses the Bible to justify racial superiority, land expropriation, home demolitions, population transfer, colonial settlements, the denial of international law, and the dehumanization of Arabs. It fuels not only Islamophobia but also anti-Semitism and Islamist retaliation against Christians. Strong statements to be sure. I’m a bit of a newbie to this discussion, so I’d love some comments on this. Sizer’s claims resonate strongly with me and strike chords of deep discomfort I’ve had all along watching US foreign policy in the Middle East. It was a relief to read a perspective which stands against to the prevailing American Christian views.